You may think this is controversial, and there are other business coaches who will disagree with me, but I don’t believe that the results you get in your business (or anything else for that matter) are directly related to the amount of effort you put in. Let me tell you a story of something that recently happened to me. You may know that about 3 years ago I took up running. From barely being able to run I eventually built up to running a half marathon last year. Since then, I scaled it back a bit and was consistently running 3 to 5 miles about twice a week. I also added in a high intensity interval training class once a week. Finally I seemed to have achieved a point in my life where I was able to fit in regular exercise and was feeling the benefits of being fitter and healthier! But then I thought I needed more – what if I put more effort in, and could get even fitter? So I went along to a new circuits class. It was really tough! Weights to be lifted, pull ups to be attempted, new challenging equipment that I’d never seen before in my life and didn’t know what to do with! It hurt, I ached, and then I went back again. One of the exercises was tyre flipping, where you have to flip over a huge tyre weighing 85kg, as many times as you can within a minute. ‘I’ve got this’, I thought. ‘My legs should be strong from the running, as long as I squat deep and protect my back and use my legs to flip the tyre I’ll be fine’. And I did lots of flipping! And then gradually over the next week, I had a pain at the top of my right leg developing. I tried to run it off, but it was still there. I rested a few days, it was still there. I ended up limping around for a few weeks, popping ibuprofen, and then get referred for an MRI scan. Turns out I had a stress fracture in my pelvis! I now know that when you are flipping a tyre more than your body weight repeatedly, once your muscles are exhausted the strain goes on to your bones, causing a stress fracture. Treatment? Several weeks of rest to allow it to heal, and then tentatively start mild exercise to see how it goes. Here I am now, more than 3 months after doing the injury, and 2 months after being diagnosed, and I’m stuck doing brisk walks and have just introduced some gentle yoga – so much for improving my fitness, my extra effort actually resulted in a huge set back. When you want to take an area of your life up a level – be it fitness or in your business or something else – you make the mistake of thinking all you need to do is put in extra effort and push harder. 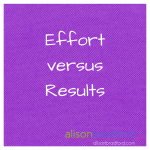 You assume there is a direct correlation between the effort you put in and the results you achieve. Don’t confuse this with thinking all you need to do is kick back on the sofa and watch daytime tv instead of working on your business. Absolutely not – some effort is still involved. But maybe it doesn’t need to be as much effort, or as hard, as you think. What if you focused more on doing the stuff that you are great at, the things that come more easily to you, and stopped forcing yourself to do the stuff you hate. Less pushing and forcing, more flowing. Previous post: Is it a lack of time, or a lack of focus?